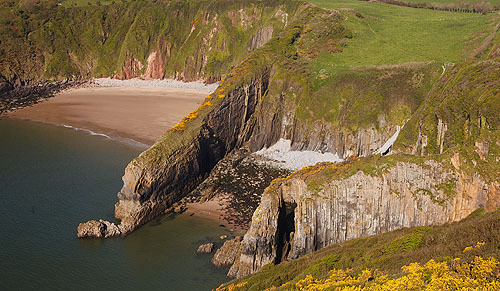 Skrinkle Haven is split into 3 coves by 2 ribs of Limestone . Skrinkle haven beach is seperated from Church Doors Beach by a massive rib of Limestone / with 2 large caves / "The Church Doors ". Church Doors Beach is seperated from a small rocky cove by another rib of limestone - "Horseback" - with a gigantic arch in the Black Rock limestone. The area is liable to rock falls .